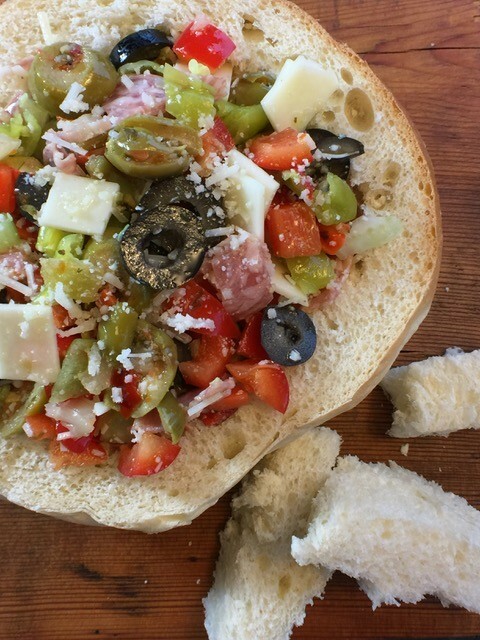 Remember that time you went to New Orleans, had one of those amazing Muffuletta’s at Central Grocery, bought a giant jar of their olive salad to take home, and had it confiscated at the gate because the TSA thought it was a “liquid”? (Seriously.) Yeah, I remember that, too. Sadly, we went home without it, and even more sad, I have been doing the mail order thing or making my own ever since. Well, no more. The search for a new Mardi Gras recipe led me to this amazing Muffuletta Dip and wouldn’t you know it that led me to a new olive salad that I can buy right at home. They sell Boscoli Italian Olive Salad at World Market, and thumbs up, it is every bit as good as the Central Grocery one. You can also order it from their website, boscoli.com if you don’t want to make the trip to World Market. Or, just make your own. Olive salad is not hard to make. It is nothing more than green olives, olive and canola oil, cauliflower, carrots, celery, red bell peppers, black olives, and capers. It will be good, but there is something really good about the bottled one, which I suspect has to do with all of the ingredients just hanging out in the bottle together for a very long time. Try the bottled one if you can. This dip is off the charts delicious. It tastes every bit like the Central Grocery Muffuletta of your dreams, sans the wait in the long line and drip down your shirt/stand up and eat experience you get in the French Quarter. It will not disappoint. 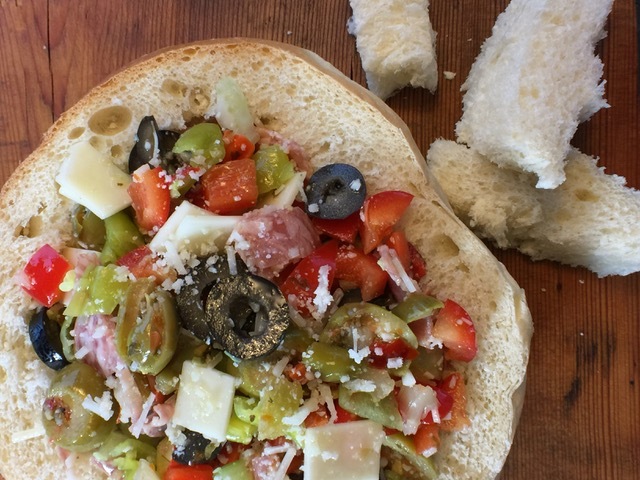 Serve this out of a hollowed-out bread bowl, Muffuletta style, with some French bread crostini or thin baguette bread slices. If you have leftovers, which I seriously doubt that you will, you can add them to tomorrow’s salad, chopped or otherwise, and laissez les bon temps rouler again. So, book that trip for Mardi Gras if you must, but rest assured that you can make a real deal Muffuletta, or dip, without ever having to face the TSA. I am clearly not over it. Combine first 9 ingredients in a medium bowl and stir together. Cover and chill for at least 1 hour. Add parsley before serving. Serve with crostini. Store covered in refrigerator up to 5 days.